Michael Yocco is the captain and owner of the MJ’s, but still enjoys spending most of his time in the cockpit. Capt. Mike was raised a fisherman by his father, Joe Yocco (right). He has been fishing Mid-Atlantic waters since he was in diapers (literally). Mike is an expert in the art of dead-bait trolling and has invented many unique rigging methods for trolling tuna and marlin with natural bait. Capt. Mike pioneered modern-day bigeye tuna fishing, and has been consistently catching these fish year in and year out since the 1990’s– long before others caught on. His tournament record is a testament to this as has won or placed over 35 times in major east coast tuna and marlin tournaments all while under the age of 34. While in his early teens, Mike honed his skills working as a professional mate aboard multiple custom and production boats along the east coast, including the MJ’s. While in the pit, he developed a passion for rigging and trolling and is constantly pioneering new methods. 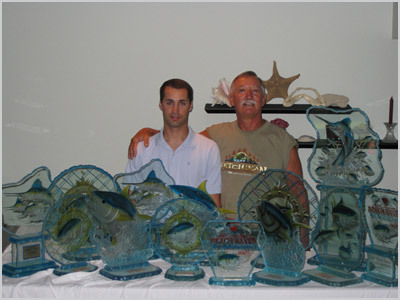 At a very young age Mike started handmaking his own lures and teasers and has conceived many utilities never seen before in the sportfishing arena. He developed new and innovative tactics and strategies for trolling pelagics. Many of these innovations started to pay off at a very early age when he swept the famed Beach Haven Marlin and Tuna Club’s invitational tournament at age 18 with three bigeye tuna.